Dan Carney February 20, 2019 Comment Now! Arizona Motorsports Park sits beside Luke Air Force Base outside Phoenix, so visiting drivers are treated to a non-stop free display of air power courtesy of F-16s and F-35s. 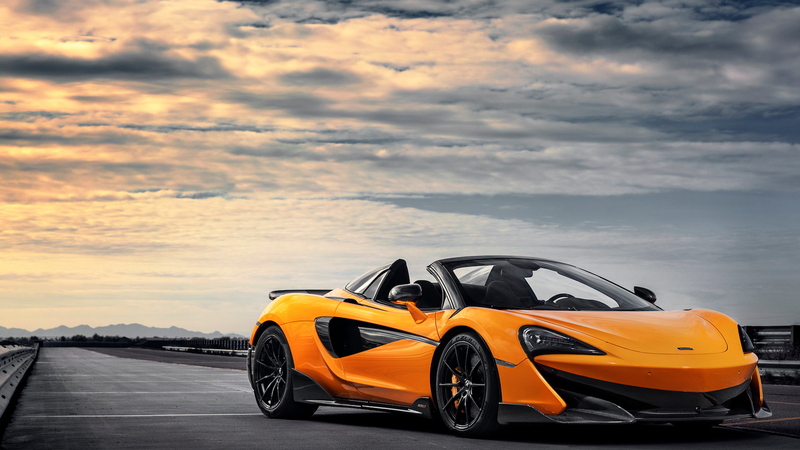 The base is home to the F-35 demonstration team, whose preparations for the 2019 air show season provided overhead entertainment as the 2020 McLaren 600LT Spider I'd been summoned to drive beckoned. While the supercar wowed on the track, the F35’s flat-spin recovery and slow-speed, high angle of attack flight drills dazzled overhead. The roaring jets provided a distinctly professional-grade soundtrack to accompany the music of the 600LT’s 592-horsepower, 457 pound-foot 3.8-liter twin-turbo V-8. The F-35 Lightning II might not produce the lyrical snarl of a P-51 Mustang’s Merlin V-12 piston engine, but the noise is purposeful and menacing. So it is with the McLaren. Twin-turbo V-8s simply don’t speak in the symphonies of V-12s, or even naturally aspirated V-10s and V-8s. This is critical for the 600LT Spider, because like the coupe, it has top-exiting exhausts that provide an aural shortcut for engine sound to the cabin. The obvious difference is the Spider’s electrically powered three-piece folding hardtop, which can be lowered in just 15 seconds at speeds up to 25 mph. With the roof out of the way, engine sound is even more omnipresent than it is in the coupe..
With the top raised, the driver can lower the 600LT’s rear window glass, which also clears a path between those dual exhaust tips and the cabin. With the window closed, however, the Spider is indistinguishable from the coupe inside. The sound never encourages felonious behavior, the way the Lamborghini Huracán’s naturally aspirated V-10 can make a driver’s right foot impossibly heavy and force the revs ever higher. Instead, the 600LT’s accompaniment is the sound of serious, seemingly dangerous force. Like the F-35, the 600LT is a fighter, not a lover, and it sounds the part. That doesn’t mean the 600LT doesn’t attempt to provide a bit of theater. It’s most evident with the engine and stability control in Sport mode, when the 7-speed dual-clutch transmission pauses dramatically mid-shift, like William Shatner delivering a classic Captain Kirk line, to ensure the completion of the shift packs more punch. Downshifts add a bit of crackly overrun even more worthy of Shatnerian histrionics. In ESC Dynamic mode, however, the 600LT is all business, like Chuck Norris bluntly delivering the lines before bluntly delivering the blows. Here, the shifts come quickly and without aural fanfare to help the car gobble up tarmac. Drivers shopping the 600LT for theatrics could be disappointed. But drivers shopping the 600LT for astonishing track performance are certain to be satisfied. The sprint to 60 mph takes just 2.8 seconds, and with the roof raised, the Spider will top out at 201 mph given enough space. 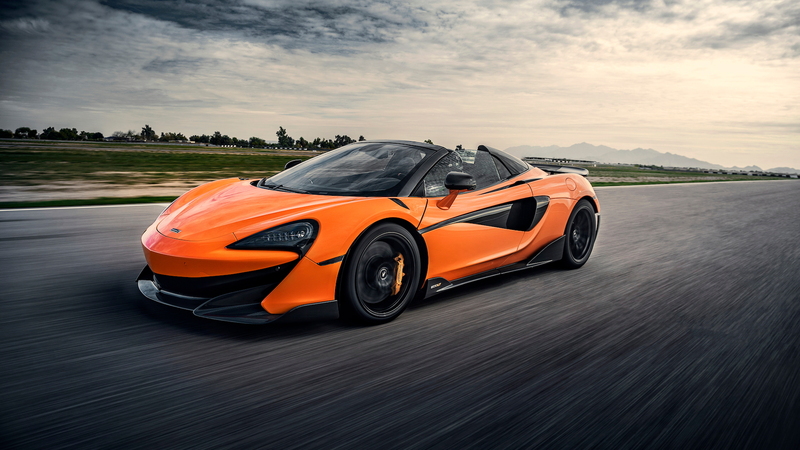 Attacking the 2.2-mile laps of AMP, the 600LT Spider betrays none of the extra 110 pounds of convertible top weight it carries over the coupe, even if the stopwatch might inevitably find a couple tenths of a second difference between the cars. Claimed dry weight for the Spider is 2,859 pounds. The forged aluminum 19-inch front and 20-inch rear wheels are unique to the 600LT and contribute 38 pounds of weight reduction versus the coupe. A couple trips over cattle guards en route to the track revealed no cowl shake, the bane of open-topped cars that have lost necessary rigidity when their roof was removed. 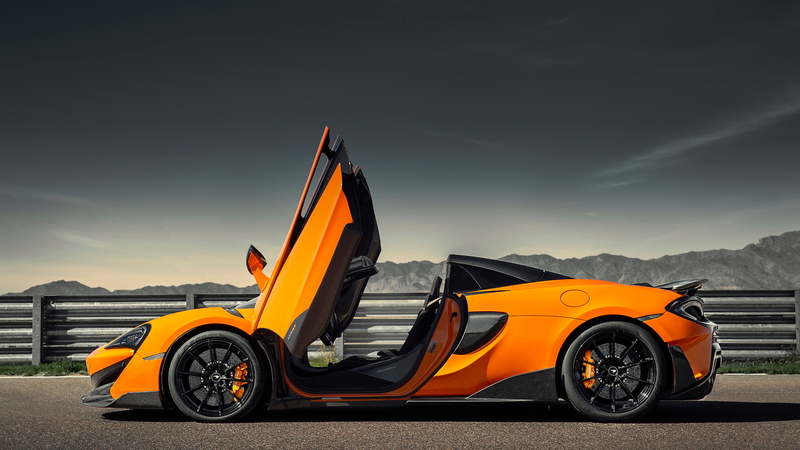 McLaren says that the 600LT’s carbon-fiber MonoCell II chassis is so strong that it doesn’t need the roof. Stiffness is the same as that of the coupe, they insist. Indeed, the carbon-fiber tub handles the vast majority of the rigidity, but a top can’t do anything but help. Judging by the seat of the pants, it’s too close to discern a difference, even if physics suggests there has to be some penalty. 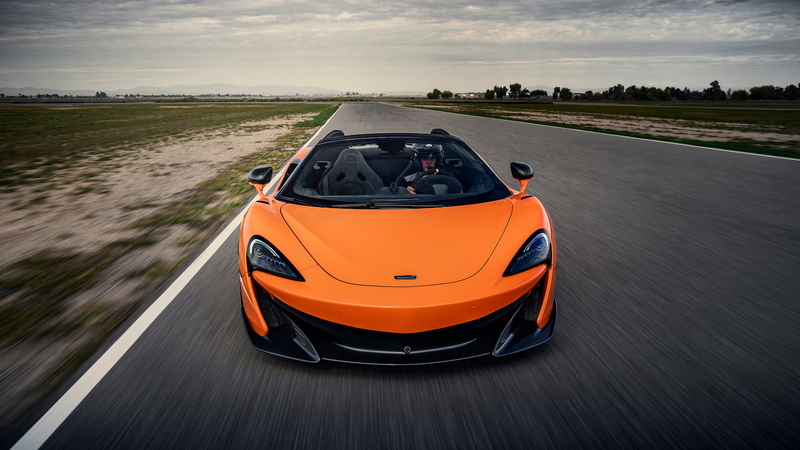 There is no loss of steering precision, as the 600LT points exactly where it is told to go, helped in part by unseen assistance by McLaren’s electronic wizardry that routes power and squeezes brakes as needed to inflate the driver’s self regard. Pushing hard, with the powertrain/stability control set to Sport mode and the suspension in Sport its mode (yes, there are two separate mode controllers), the 600LT’s safety net can be a bit conservative, metering power gently on the way out of corners until the car is pointed mostly straight. Switch the powertrain to ESC Dynamic mode, and that net is lowered, allowing the driver to hammer the throttle to induce a bit of power oversteer on corner exit, while still providing some electronic resistance to accidentally spinning the car. The customized Pirelli P Zero Trofeo R tires, which McLaren says were developed with a stiffer belt construction, do their part as well to maintain traction. Brakes, as in the coupe, are stupendous, and they let the driver confidently shift weight onto the front tires for crisp corner turn-in while lightening the rears to help rotate the car toward the corner exit rather than scrubbing off speed with front tire-sliding understeer. 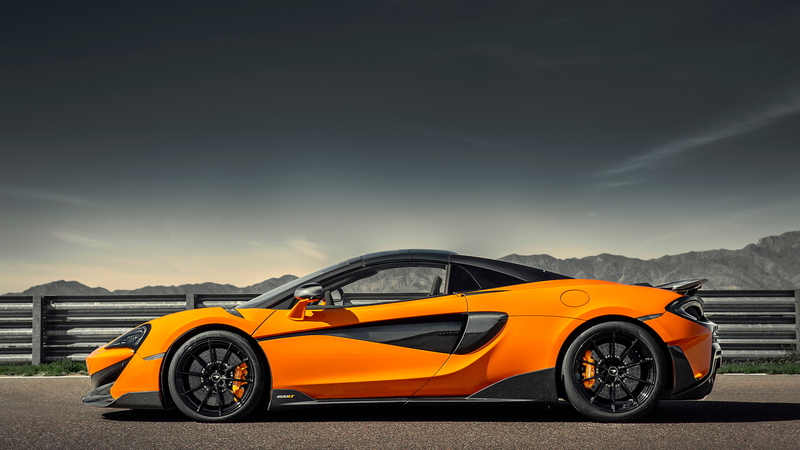 The 600LT’s lightest-in-class curb weight makes the brakes’ job easier. The brakes are not Brembos, incidentally. McLaren prefers Japanese brake company Akebono, and they get on with the business. The 600LT features the electrically powered brake booster that provides more consistent brake assistance than boosters powered by engine vacuum, contributing to a consistent, communicative brake pedal. The antilock brake system works without unsettling the car while braking at the limit, a welcome contrast to the brakes on Lamborghinis, which are distinctly (and intentionally) biased toward user-friendliness around town at the expense of confidence-inspiring stability at elevated racetrack speeds. The Spider’s 220 pounds of aerodynamic downforce at 155 mph also help stabilize the car when pounding the brakes at the end of a fast straight. The 600LT’s carbon-fiber racing seat is adjustable only forward and back, and it holds the driver snugly in place while the Trofeo R tires apply side loads that would otherwise try to slide the driver out of the seat. The car’s Alcantara-wrapped cabin is probably the only visual clue that the 600LT is a member of McLaren’s Sport Series of “entry-level” cars. Compared to the cabin of the Super Series 720S, the 600LT’s cockpit has the British cottage industry look of a TVR’s dashboard, or maybe a Lotus Esprit. It isn’t bad, but it is a little Spartan and homemade-looking for a car with a base price of $256,500. But the F-35 Lightning IIs cockpit surely looks even more industrial. I didn't chat with the pilots rocketing overhead, but I doubt they complain about the F35’s cockpit’s amenities while performing feats of aerobatic heroism. The same holds for 600LT drivers down on the racetrack. Like the F35, the 600LT’s cabin and the sound the engine both get the job done.